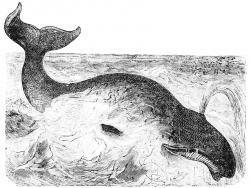 Those sassy whalesCourtesy Currier &amp; IvesWord on the street is that sperm whales may have individual names. I hope so, frankly, because I'm sick of calling them ... that. Sperm whales, it seems, have calls that are unique to the region they live in. So whales in the Caribbean might have a different call than whales living in the South Pacific. But there are parts of sperm whale calls that are, on the surface, the same in whales around the world. I say, "on the surface" not as some ocean-related pun, but because there's a part of the whale's call—five clicks at the beginning of a call—that seem to be totally unique to individual whales. All whales make the five clicks, but if you analyze the sound in detail, there are actually subtle variations in the sounds that are unique to the whale making them. 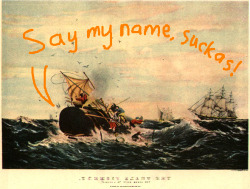 Because it comes at the beginning of each phrase, or "coda string," and because the variations are perceptible from every direction (some whale calls sound different depending on how the listener is oriented to the caller), some scientists think that the clicks could represent the "names" of individual whales, who are identifying themselves as they call out. There are, like, dozens of other possible names. These are just the first to come to mind. A sperm whale: You will never get my precious iron feces! Never!Courtesy PacmanIt would be a very special day indeed if a better story than this one popped up. But I wouldn’t ask for that. How could you want any more than this: whale poop fights global warming*. Sperm whales are the particular focus of this study. The population of sperm whales in the Southern Ocean (the waters around Antarctica) is thought to be about 12,000. (There are more sperm whales in the world, but the study looked at Southern Ocean sperm whales.) Those 12,000 whales are thought to put about 200,000 metric tons of the greenhouse gas carbon dioxide into the atmosphere each year. That’s about the same amount that 40,000 passenger cars contribute each year. Destroy those polluting whales, right? Wrong! See, it turns out that these sperm whales are also responsible for the removal of 400,000 metric tons of CO2 each year, making up for the amount they produce two times over. Their secret is this: they poop iron. They don’t only poop iron, but sperm whales poop a lot of iron—each whale is thought to defecate about 50 metric tons of iron each year. That’s over 300 pounds a day! Obviously the whales aren’t pooping out solid iron ingots, though. It’s mixed in with their liquid feces. And that’s important. The whales themselves don’t remove those 400,000 tons of CO2. They’re removed by phytoplankton. Phytoplankton are microscopic organisms that, like plants, use sunlight and CO2 to build their bodies. And they feed on iron. The whales have lots of iron in their diets, because of the large amounts of fish and squid they eat. So the iron-rich whale poop is an ideal nutrient for phytoplankton. When the phytoplankton dies, the carbon they contain falls to the bottom of the ocean instead of being released back into the atmosphere. Where more carbon is trapped than is released back into the atmosphere, it’s called a “carbon sink,” and that’s what whale poop and phytoplankton create in the Southern Ocean. Other parts of the ocean may naturally contain more iron for phytoplankton, but the Southern Ocean is poor in the nutrient, and the microorganisms rely on an iron cycle that the whales apparently play a large part in. More whales, greater carbon sink. Fewer whales, less whale poop, more atmospheric carbon. Coincidentally, the International Whaling Commission will be meeting next week, to discuss regulations on how many whales can be harvested from the oceans each year. It’s a complicated world, isn’t it? *I thought about making the headline “Whale poop is ‘green’” but… yuck. "Blerg," says the whaleCourtesy Michael CATANZARITIA Caribbean whale of an as of yet undetermined species did its best to humanely end the ridiculous lives of two British millionaires, but the attempt was ultimately unsuccessful. By either striking the 47-foot yacht, or shrewdly allowing the yacht to strike it, the whale placed a small hole in the $245,000 boat, which began to slowly fill with the warm, salty water surrounding the British Virgin Islands. After feeble attempts at stuffing pillows into the hole, the couple retreated to the lifeboat to preserve their ludicrous existence. One of the humans did, however, briefly return to the damaged and sinking vessel for a change of clothes, not wanting to be seen in her “sailing boots and shorts” when rescued. No doubt overcome with depression by this final site, the whale made no further attempts to separate the sailors from their lives. One of the best afternoons of my life was spent on a boat off of Cape Cod watching humpback whales frolicking. Now, in the video below, the roles are reversed thanks to the "Crittercam." The new technology used to give us an animal's-eye-view of the world has been strapped on a humpback to show us what they see in the waters. Enjoy. 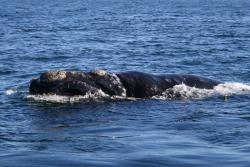 Right whale makes a comeback. After being hunted nearly to extinction a century ago, the North Atlantic right whale is starting to make a comeback. Though still critically endangered, it's population has tripled in recent years, and this year has already shattered the record for live births. 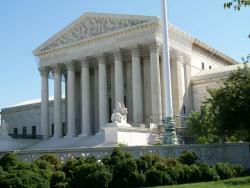 The U.S. Supreme Court has issued its ruling on the sonar conflict between the U.S. Navy and Pacific ocean whales. You're happy if you're the Navy, sad if you're a whale. Here's the link to the initial report of the case from earlier this fall.